Rustic Wedding Cakes- Hand Made and Set up for you. 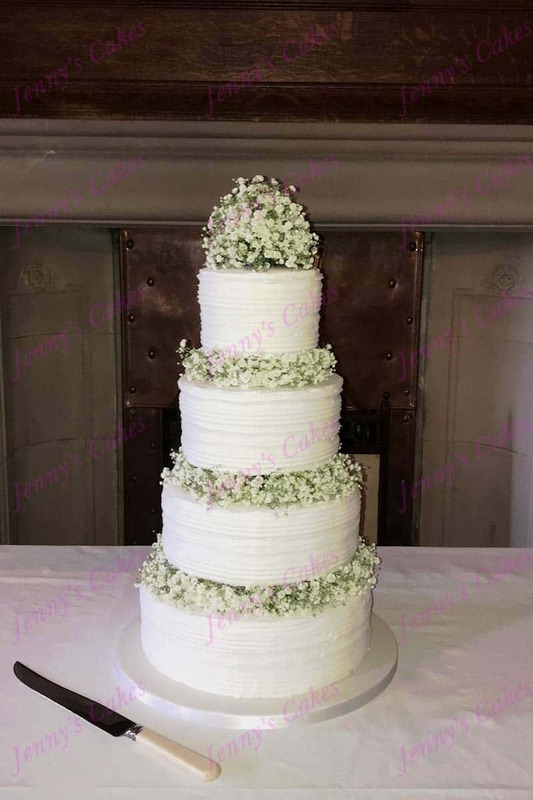 Over the last few years, we at Jenny’s Cakes have made a lots of ‘Rustic’ Wedding Cakes, designed to fit in with more relaxed rustic wedding themes. Our Rustic Wedding Cakes are usually stacked together, typically decorated with a butter-cream finish. Sometimes, food-safe flowers or artificial flowers are also used- this is a great way to incorporate details from the bride’s bouquet. Fresh flowers can also be used as a cake topper. These are provided by your florist, and we can advise you or your florist about the best sizes of floral cake topper to use. You can specify your preferred choice of ribbon- we can offer you lots of different types of ribbons (such as hessian ribbons) , satin or lace ribbons or even raffia trim into the cake decoration. The idea of a rustic wedding cake is to complement the room or venue decor, for example your table centre-pieces, table runners and chair covers, so that the cake echoes the overall look of the wedding and provides an appropriate centre-piece for the all-important cutting the cake photos! 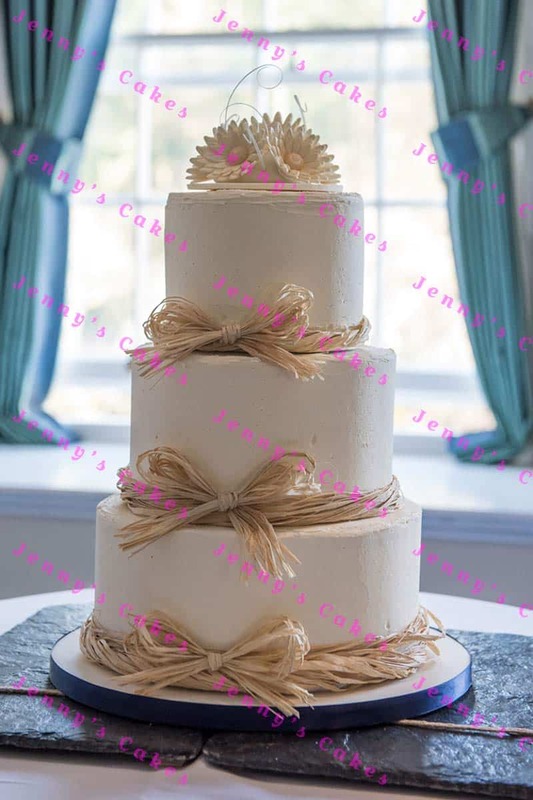 In this post we show some recent rustic wedding cake photos. We offer single tier cakes for smaller rustic weddings, up to four or even five tier cakes. 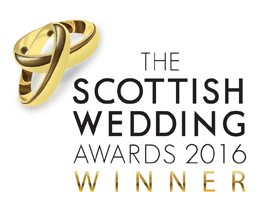 Sizes, number of tiers and details can all be adjusted to suit individual tastes and differing scales of wedding, from small intimate family groups, up to larger marquee wedding parties. We have more examples of Naked Wedding Cakes here. This wedding cake shows use of ridged butter-cream tiers with a naked cake top tier and custom cake topper (provided by the bride and groom) dressed with seasonal berries and silk roses, finished with a dusting of icing sugar! We had a number of very hot spells of weather in Scotland this summer, and several of our brides wanted a butter-cream finish but were concerned about the possible problems of the butter-cream decoration melting. 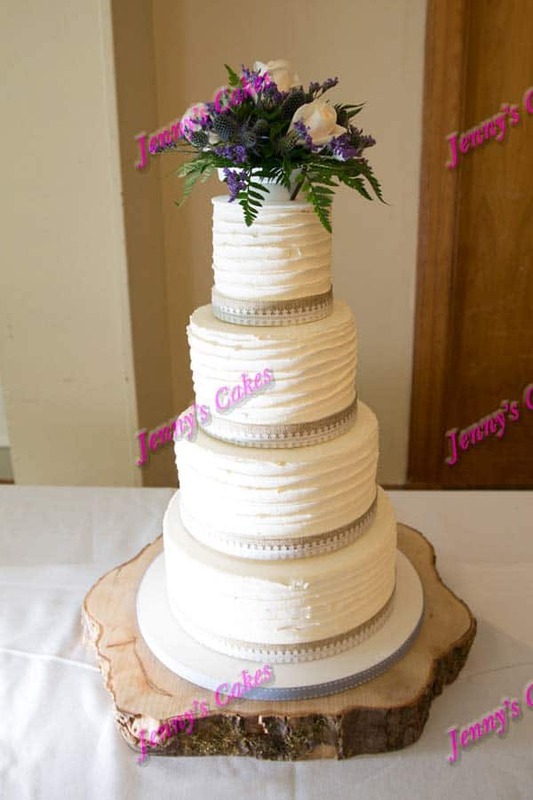 The four tier cake shown below is a new idea from Jenny’s Cakes! It looks like a butter-cream finish, but is actually a specially formulated Royal Icing decor, so will not soften and smudge in the (unlikely) event of a Scottish summer heatwave! This rustic wedding cake design has the country style appearance, but will withstand 30 degrees plus! This example is decorated with rings of fresh gypsophilia and a ‘gyp’ cake topper. 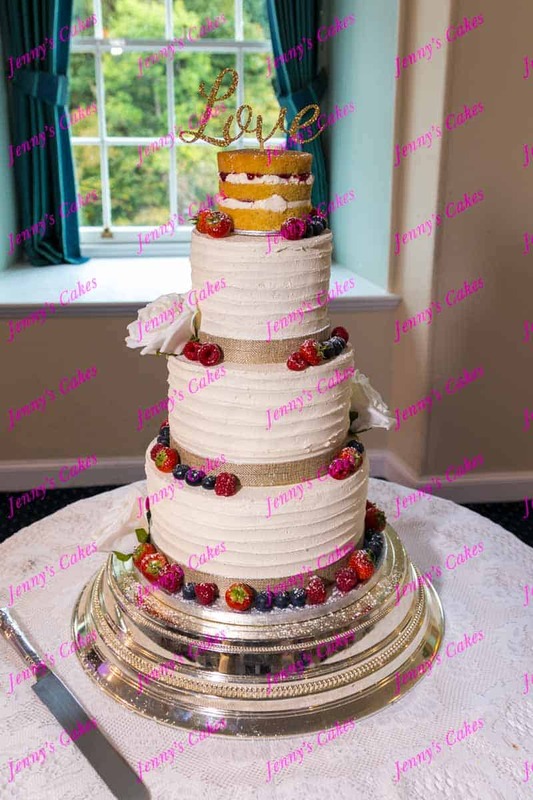 The photo above shows a combination of finishes, smooth butter-cream on top and bottom tiers, and a Naked Red Velvet middle tier. 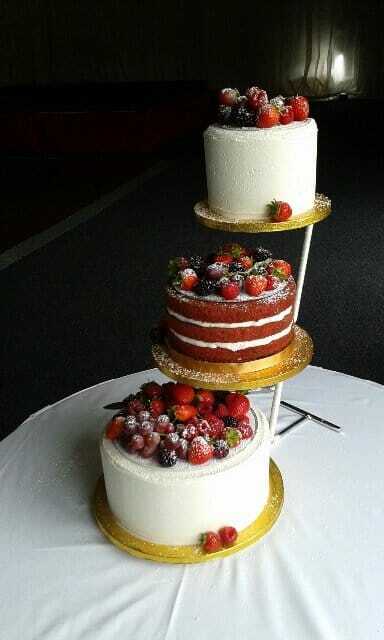 Displayed on a tall metal stand, and dressed with summer berries and a sprinkle of Icing Sugar! 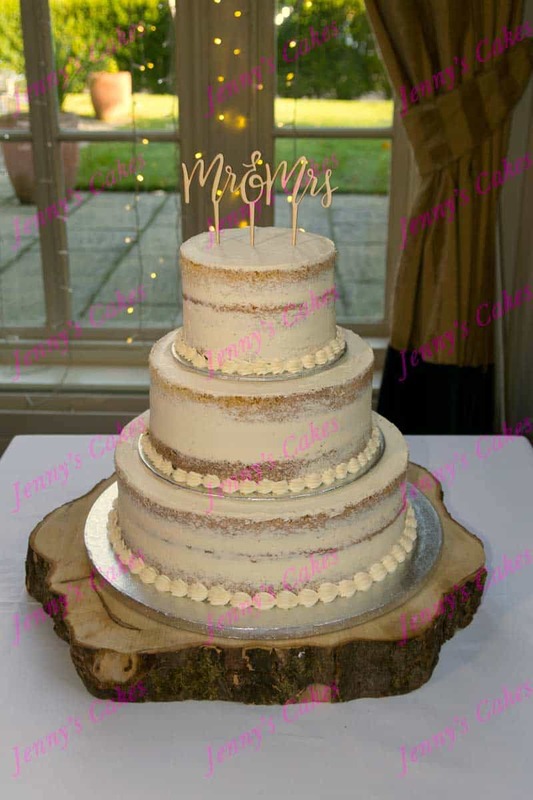 A recent trend in rustic or country style wedding cakes is the ‘semi-naked’ wedding cake– Above is a photo of a three tier stacked semi-naked cake, displayed on a tree trunk slice. (Cake topper provided by the bride and groom.) This cake will be dressed with fresh flowers, photo to follow! We hope you enjoy these examples of wedding cakes suited to a country or rustic wedding theme. 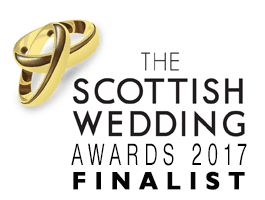 Please get in touch if you would like to discuss your wedding cake ideas with us!